I’ll be hosting an open house at The Portal Over Lake Union on Sunday, May 18th from 1 – 4 pm. The Portal is located at 655 Crockett Street, access is from Dexter Avenue. Separate loft area with an adjoining closet. The space is completely customizable – use it as an office, studio, 2nd bedroom or media room – whatever fits your need. 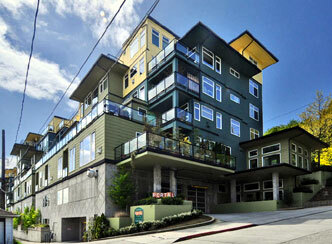 The Portal was constructed in 2004 consisting of 76 condominium homes in two buildings overlooking Lake Union. Though the buildings back to Aurora, the homes are on the East-side with the common hallway buffering the homes from Aurora. Amenities include a courtyard off the community club room and an expansive roof top deck. Access to the Portal is via Dexter Avenue. Very cool building that is reminiscent of something you might expect from MK Designs. Good luck with the listing!